Why sometimes Tahitian Noni® Juice gets thicker? The Tahitian Noni® Juice is still good when thick. One thing that occurs naturally in the fruit is pectin. Just like in jam, pectin will set over time. This has been the cause of some of the thickening. The pulp from the fruit may settle some, as well. There's no alcohol in Tahitian Noni® Juice. However, there is small percentage of grape juice in it to improve flavor (the only commonality between the Tahitian Noni® Juice and wine.) and is necessary to cover the offensive taste of the Noni fruit. Tahitian Noni® Juice contains no preservatives, fillers, artificial flavoring, coloring, or additives of any kind. What are Shipping and handling charges for 2 day or next day delivery? What is the difference between Koshar Tahitian Noni® Juice and regular Tahitian Noni® Juice? The main difference between the Kosher Tahitian Noni® Juice and the regular Tahitian Noni® Juice is that the Kosher juice is made with Kedem Juice and the regular is made with standard grapes. The Kosher juice has been approved as Kosher. For a product to be considered "kosher" it must be certified by Jewish authorities. After the juice is being processed is being kept in a bin and then the Rabbi blesses that juice and it becomes Kosher. It is kind of ritual cleaning. The symbols on the bottle are O U symbol and the certification symbol of Kehilas Belz Congregation. There is also some price difference in the two. Buy Now with 30 day money back guarantee! What Nutrition Information appears on the Tahitian Noni® Juice bottle? What are ingredients of a morinda Citrifolia fruit? 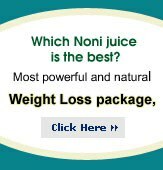 Please click hereto read more about contents of Noni fruit. Find out how to buy Tahitian Noni® Juice at Cheaper Price! How many milligrams of Noni is in an ounce? This question applies more directly to juices made from powdered Noni. As Tahitian Noni International does not dehydrate Tahitian Noni® Juice, Tahitian Noni International does not declare an amount per serving. The Noni in Tahitian Noni® Juice remains a juice throughout processing. Usually there would be over 26,000 milligrams of Noni in one ounce. But this amount includes the water content that is natural to the fruit. As you can see, the comparisons are not exact. How much sugar is in the juice? The fruit concentrates in Tahitian Noni® Juice do not contain any added sugar. The only sugar present is naturally occurring in the fruit. In the juice there is about 2 grams of sugar per serving, as typical of most fruit juices. Tahitian Noni® Juice can help you to take control of your life as you can see from the information in Research Studies. Who is blowing the shell on the bottle of Tahitian Noni® Juice? His name is Hiro. Hiro is a Tahitian Chief and Warrior, famous for his strength and leadership. You can see him blowing the shell on the logo of all Tahitian Noni International products including on the bottle of Tahitian Noni® Juice. What is the difference between Cold Pressed & Pasteurization? Is Tahitian Noni® Juice is cold pressed or pasteurized? Cold pressing is basically squeezing the juice from the fruit. The resultant juice must then be pasteurized, as required of all fruit juices. Pasteurization is rapidly heating a liquid to high temperatures to kill microorganisms. To comply with US FDA regulations for fruit juice processing, a juice must be pasteurized. If it is not, a warning statement must be present on the label. This law is found in the Code of Federal Regulations Title 21 Section 101.17. Is there a lot of acid in Tahitian Noni® juice as I am supposed to stay away from acid fruits and vegetables? The pH of the juice, as in the bottle, is about 3.4. However, after digestion and metabolism, the pH of the remaining material is alkaline. Thus, the contribution the juice will have on overall blood pH is an alkaline effect. What is the sales volume of TNI per month? On a monthly average, TNI’s sales volume is 55 Million. Is there any patent on the products developed by TNI? NI Holds 40 U.S. patents and patents pending, with 66 international patent registrations pending. It also controls the harvesting, transporting, processing, and manufacturing process from tree to bottle. TNI owns and maintains the largest Noni-dedicated research facility in the world; and also owns and operates the largest Noni-dedicated processing facility in the world.